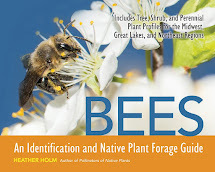 I have been reading the Attracting Native Pollinators book released by the Xerces Society, and it got me thinking about where I would see bumble bees nectaring in my yard. 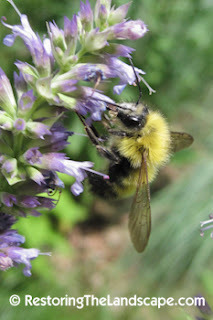 So I went through my photos to see what natives I captured bumble bees nectaring upon this past summer. It's important to provide nectar sources for our pollinators throughout the year. 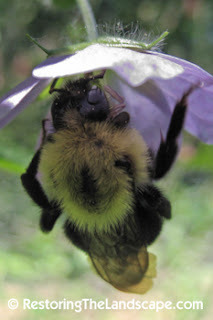 Bumblebees are one of the first bees to emerge in spring and last well into late fall. Wild Geranium ~ Geranium maculatum was an early spring favorite, pictured here at the end of May. We had Wild Geranium growing in our yard so we have many seedlings available to transplant throughout the yard. This is a great native plant for sunny dry sites. If you're a licorice fan like me, you'll love the anise smelling foliage. Culver's root likes moist, rich soils but can spread quickly in your landscape. I have planted it in slightly drier conditions and it does not spread as quickly. The bees love this native, as well as many wasps species. 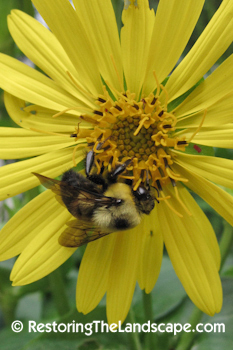 Cup plant is a tall, sunflower like native with large coarse leaves that join at the stem to hold water. It is rated as one of the best wildlife natives for its nectar, water, seeds and cover it provides. 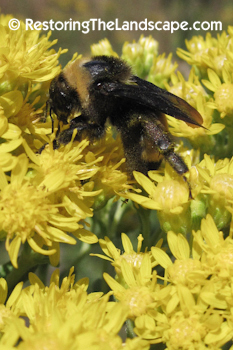 The Stiff Goldenrod in our yard this year won the pollinator prize. I did a post in early September about all the different pollinating insects it attracted including bees, flies, wasps butterflies and beetles. 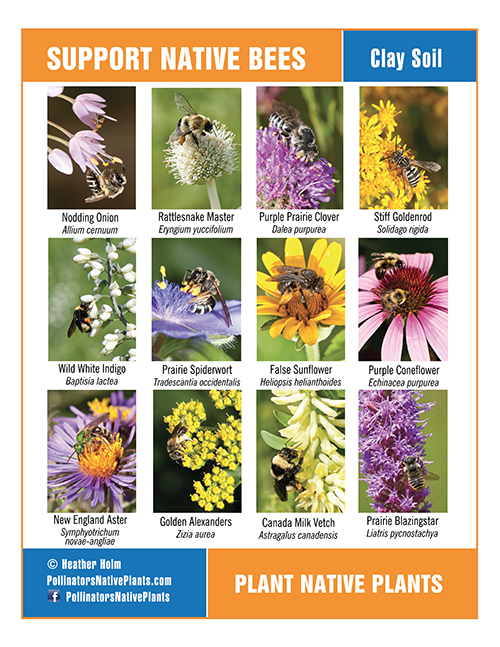 What plants in your yard attract the most pollinators? 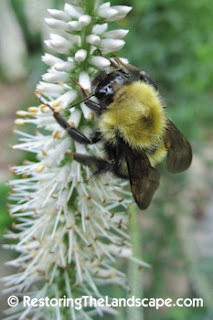 Carole Brown wrote a good post about native pollinators too this week on the Beautiful Wildlife Garden blog. 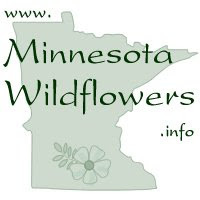 Check out more native wildflowers at Clay and Limestone for Wildflower Wednesday.